Tracking data can be exported into the C3D file format. C3D (Coordinate 3D) is a binary file format that is widely used especially in biomechanics and motion study applications. Recorded data from external devices, such as force plates and NI-DAQ devices, will be recorded within exported C3D files. Note that common biomechanics applications use a Z-up right-hand coordinate system, whereas Motive uses a Y-up right-hand coordinate system. More details on coordinate systems are described in the later section. Find more about C3D files from https://www.c3d.org/. Frame Rate Number of samples included per every second of exported data. Start Frame Start frame of the exported data. You can either set it to the recorded first frame of the exported Take or to the start of the working range, or scope range, as configured under the Control Deck or in the Graph View pane. End Frame End frame of the exported data. You can either set it to the recorded end frame of the exported Take or to the end of the working range, or scope range, as configured under the Control Deck of in the Graph View pane. Use Zero Based Frame Index C3D specification defines first frame as index 1. 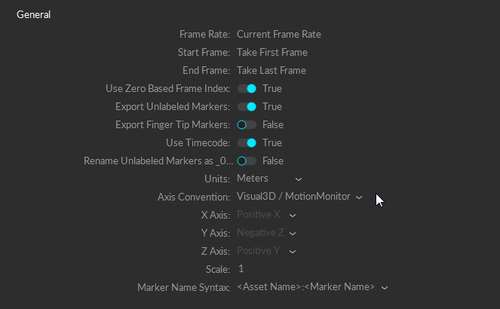 Some applications import C3D files with first frame starting at index 0. Setting this option to true will add a start frame parameter with value zero in the data header. Export Unlabeled Markers Includes unlabeled marker data in the exported C3D file. When set to False, the file will contain data for only labeled markers. Rename Unlabeled As _000X Unlabeled markers will have incrementing labels with numbers _000#. Units Sets which unit is used in exported data. Axis Convention Sets the axis convention on exported data. 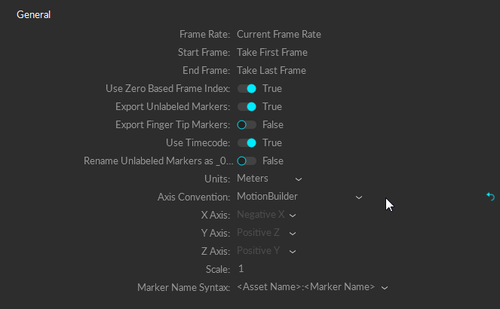 This can be set to a custom convention, or preset convetions for exporting to Motion Builde or Visual3D/Motion Monitor. X Axis Allows customization of the axis convention in the exported file by determining which positional data to be included in the corresponding data set. Scale Apply scaling to the exported tracking data. Marker Name Syntax. Choose whether the marker naming syntax usese ":" or "_" as the name separator. The name separator will be used to separate the asset name and the corresponding marker name in the exported data (e.g. AssetName:MarkerLabel or AssetName_MarkerLabel or MarkerLabel). This page was last modified on 10 January 2019, at 14:28.